Along with the launching of new woods and irons on an annual basis Callaway Golf has been shortening the interval between wedge launches of late, with the Mack Daddy 4 wedges the latest short-game weapons from the brand to hit the market. You wouldn’t be wrong in thinking that not much has changed in the design of the Mack Daddy 4 wedge compared to its predecessor the Mack Daddy 3. 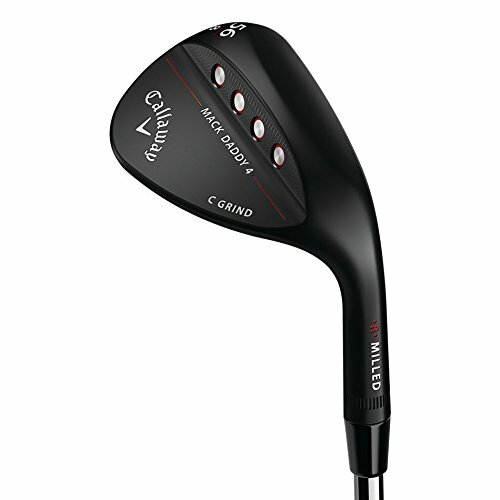 However, in this case you are very wrong, for while the aesthetics of the wedge look fairly similar to previous model there has been significant improvements to many features on the wedge that do in fact make it an all-out better club, with more options to choose from in terms of loft and sole grind. This is the best wedge Callaway has produced since the MD2 Tour Grind forged wedge a few years back. Despite being a cast wedge the Mack Daddy 4 has a spectacularly soft feel and the updated groove configuration on the face really enhances the spin and control. The way that certain elements progressively change as the loft changes also ensures you get the maximum performance from each Mack Daddy 4 wedge making these short game clubs easier to use for all golfers. A very soft yet solid feel at impact almost as if the clubface grips the ball and throws it at the target. The variety of loft and grind combinations ensures there is the perfect Mack Daddy 4 wedge to suit your needs and fit into your set. The three different finishes offer plenty of choice from reducing glare to adding some shine to your bag. The raw version is a great addition to the range for those who prefer a wedge that rusts. The massive range can make it confusing when selecting the necessary wedges to suit your bag setup. The Women’s version is only available in three different lofts. The Mack Daddy 4 wedge is packed with new and improved features that make it one of the most versatile ranges of wedges on the market. 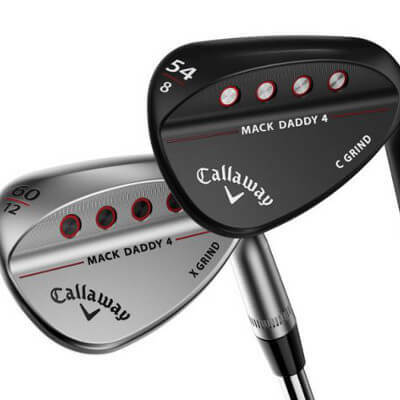 It seems to be quite a trend these days where wedge designers produce progressive wedges through the various lofts to ensure the best launch and spin characteristics and Callaway is no different with the Mack Daddy 4 wedges. The variety of loft and grind combinations is proof of this, but it’s the addition of milled aluminium medallions in the weight ports behind the muscle pad that alter the CG of the wedges in certain lofts to improve the performance through the air. Mack Daddy 4 wedges provide the best control of any wedge the brand has produced in many generations. This is due to the micro grooves between the normal grooves actually protruding instead of being milled into the face. These positive micro grooves grip the ball more effectively as it slides up the face at impact to ensure much better control on shorter shots and bunker shots. The addition of a half groove near the leading edge also helps to add some spin to shots that need to be nipped of tight turf. The four different grind options provide improved performance for all golfers. The C-grind offers more relief near the heel and toe section of the sole to allow for more versatility when playing shots with an open face. The S-grind has slightly less relief in the heel and toe and is more traditional in design to keep the leading edge of the club closer to the ground at impact. The W-grind is wider near the middle and toe with some heel relief and this ensures the bounce of the club is maintained more effectively for use on a wider variety of turf conditions. The X-grind is new and features a narrow, high bounce crescent sole with a low point near the leading edge. This is helpful for players with steep angles of attack and softer course conditions. The look of the Mack Daddy 4 wedge combines the higher and straighter toe style of the MD Forged wedge and the straighter leading edge of the MD2 Tour Grind forged wedge. Each wedge really sets up nice and square at address while the various finishes are great, especially the Matte Black version. The red grip and sticker on the shaft adds a new dimension of colour to the wedge too. It may seem like $150 for a single wedge is expensive, but this is the going rate for a short game club these days among the top brands and the Mack Daddy 4 certainly deserves to be among this list. You get plenty of choice and performance for your money with durability not seen in a Callaway wedge before.